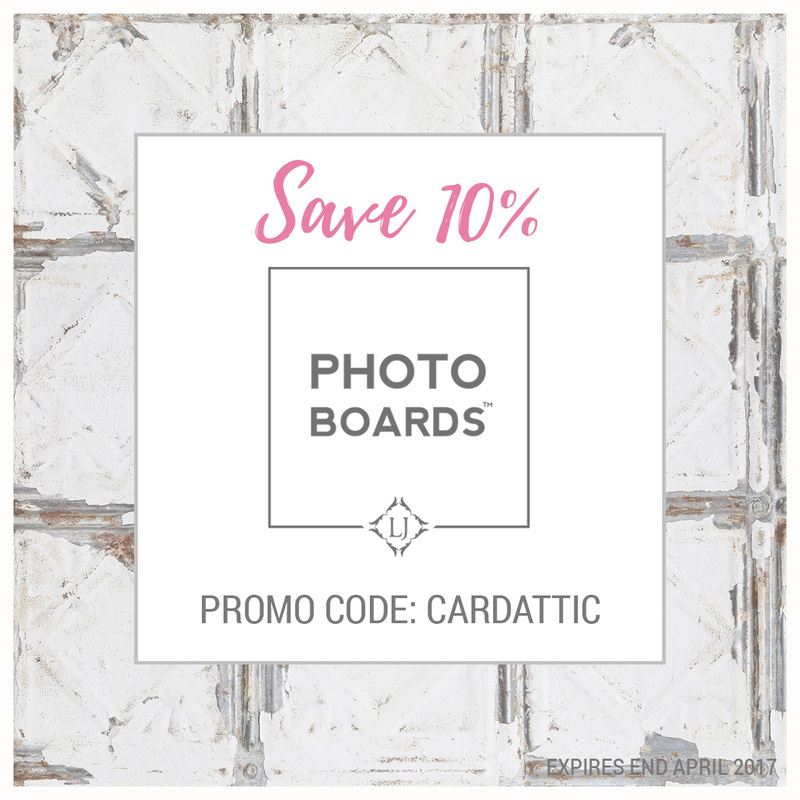 Hello lovely crafty friends. I hope this finds you all well. 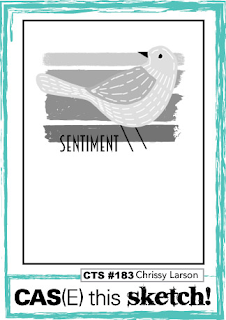 Today's post is for the CAS(E) This Sketch #183 Challenge, which is the lovely sketch below by Chrissy Larson, which looks like this. 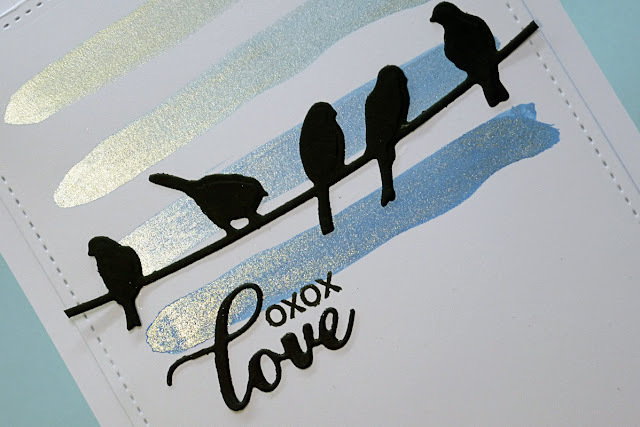 I don't have any single bird dies, but as soon as I saw it, I thought that I could finally use a hitherto unused Spellbinders 'Bird On A Wire Die', that I have had for ages! As usual, I will post the pictures first, and then those who are in a hurry can get off. Then, for those who are interested I will post the supplies and details below. First I took a plain white card base and a plain white panel and cut the panel with a stitched rectangle die. Next, I got four different blues of Imagination Crafts 'Starlight' paints - the shimmer is incredible - and mixed a tiny drop of each with some water in a sectioned painters palette and painted the four stripes, going from lightest blue to the darkest blue and let that dry. 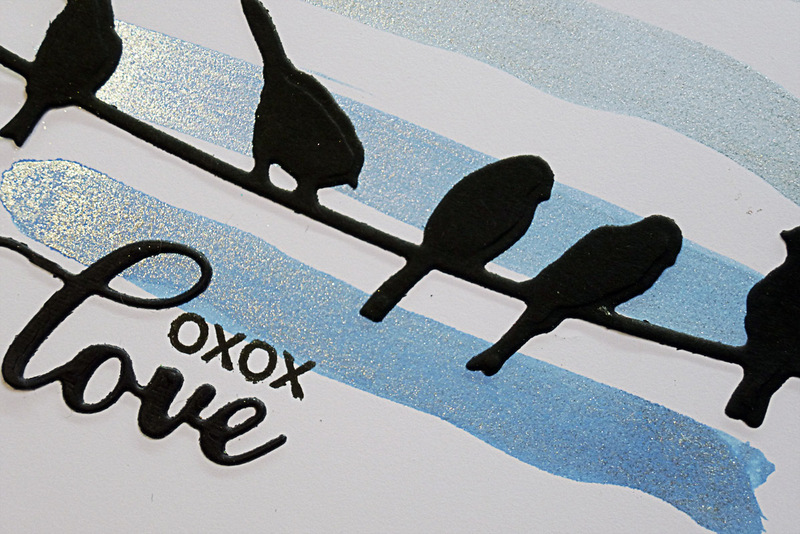 Whilst the paint was drying, I cut the birds and sentiment out of black card-stock. 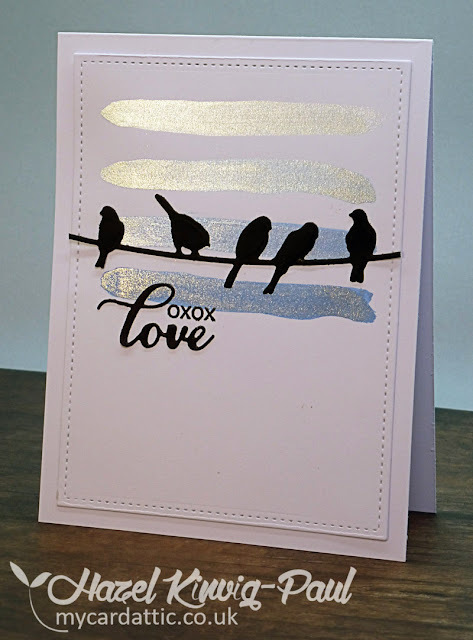 Once my panel was dry I adhered the birds and the sentiment and stamped the hugs & kisses and called it done! Thank you so much for your visit today and especially if you have left a comment. You are all appreciated more than you know! Have a wonderful weekend folks! There certainly is a gorgeous shimmer to those paints. A beautiful die too and a great CASE. Have you ever used Teinkling H20's? If so, just wondering how these compare to your Starlight paints? This is really a great card. I love the iridescent colors! Very impressive! Beautifully composed you card, it is perfect !!! Wow! The shimmer paint IS incredible! I love what you did with the sketch, I am actually working on this one today. A shimmery masterpiece! 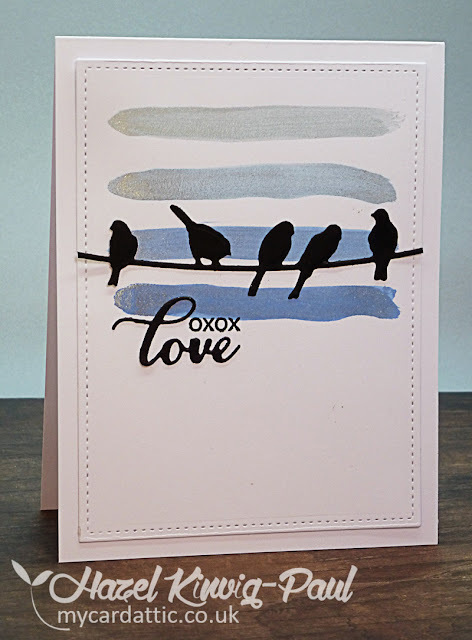 I love the ombre effect of your stripes and the bird on a wire die cut looks absolutely brilliant with that background. Oh, this is so perfect! I love the shimmer in your stripes! Fabulous take on the sketch! 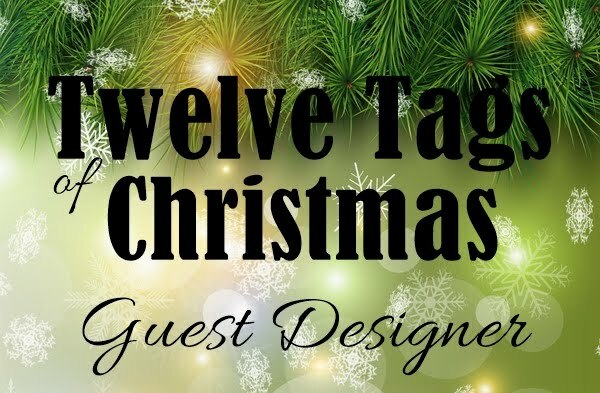 Thanks for adding this beautiful work to our CTS gallery! 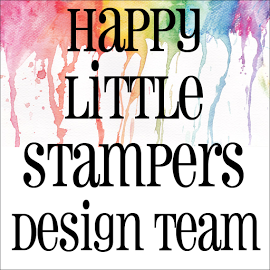 Your shimmery stripes are just beautiful and set off the birds perfectly! 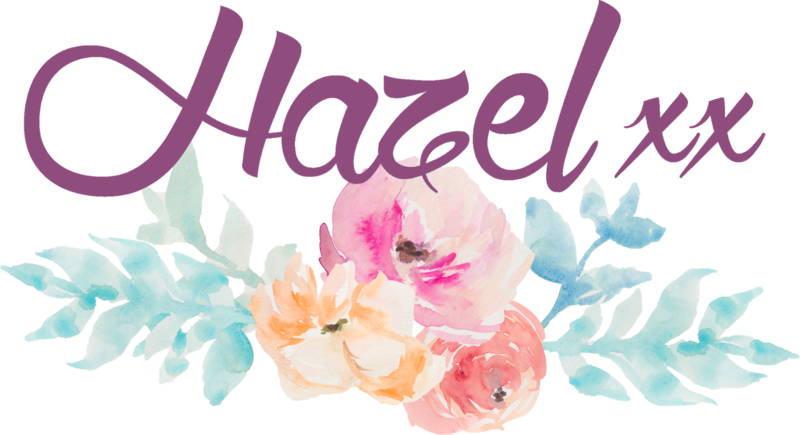 This card looks amazing, Hazel. WOW, this is simply STUNNING, my fiend!!!! Those shimmery paint strips look awesome and the birds are so lovely - can't believe that you actually painted those strips yourself and not stamped it - you've done it so neatly and they're perfect!!!! And the birds on the wire - so cute!!!!! Talking about a winner...!!!! This is simply beautiful! THose shimmery paints really add great interest to this already stunning card! I predict a win! Those shimmery stripes are a gorgeous background for the birds on a wire! Beautiful! 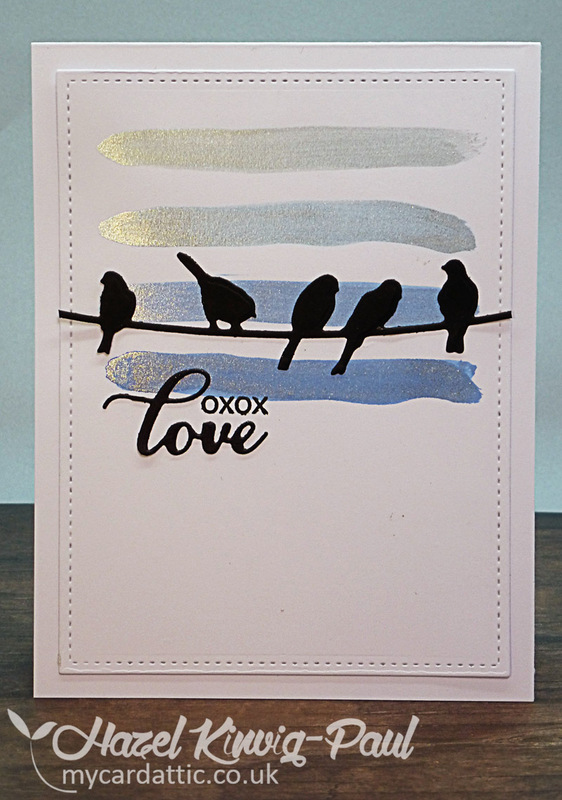 These shimmery stripes are a perfect backing for this wire of birds!